Marcus Baum and their team of top notch conveyancers, committed to innovation and progression, were a perfect fit for Hoowla’s legal technology. 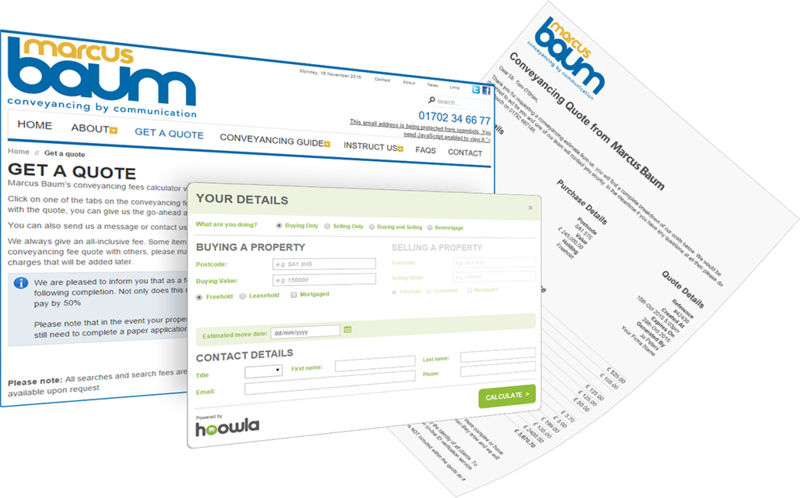 They installed Hoowla’s conveyancing calculator on their website because they know what makes their clients happy. There are no setup costs and the tiny annual fee makes it a no brainer if you’re looking to empower staff, save them time and increase business through your website. It even comes free for customers using Hoowla’s full legal software. Hoowla provides software to the legal industry, developed in the UK using the latest technology. They help law firms of all shapes and sizes around the country to modernise their offering, process more matters, improve communication and collaboration, reduce risk and manage compliance whilst providing a great customer experience along the way.